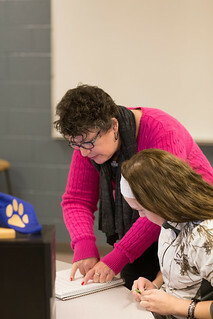 Developmental education at Barton Community College provides a post-secondary educational opportunity, sensitive and responsive to the individual differences and special needs among learners. To facilitate academic preparedness, we support diagnostic testing and placement, develop and provide general and discipline-specific learning strategies, and assist students in coping with barriers to learning. In 2011, Barton began a redesign of developmental courses in math, reading, and writing on the Great Bend campus. The purpose of the redesign initiative was to develop more efficient instructional methods to help students achieve college-readiness and to decrease the cost to students in time and money. The redesign formats implemented at Barton include modified emporium style with modularization [College Prep Math, Basic and Intermediate Reading], accelerated learning [College Algebra with Review and English Composition 1 with Review], and integrated courses [Integrated Reading and Writing]. Barton ACE: College Prep Math and the Reading courses allow students the flexibility to adjust time working on specific skills according to the amount of learning required for mastery. Individualized instruction addresses each student's specific strengths and weaknesses. Accelerated learning courses [College Algebra with Review and English Composition 1 with Review], provide the opportunity for individuals testing just below college-level to take the college-level course while receiving extra instructional support and guidance. Integrated Reading and Writing combines the competencies of Intermediate Reading and Intermediate Writing to basically create one course from two separate courses. The course emphasizes the connection between reading and writing and builds on the similarities to help students develop a balanced understanding of the two processes. Check out the Bulletin of Classes for availability of courses in a term.